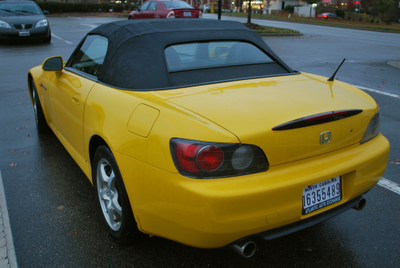 Finally, after weeks of searching for the right car, I got it! 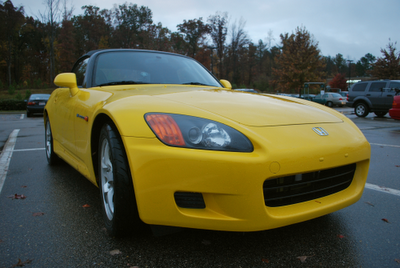 Meet my new autocross toy: a 2003 Honda S2000, in bright metallic yellow, which I got my hands on with mere 45.8 thousand miles on it. A friend from Tarheels pointed me to Atlantic Auto Exchange who are a club sponsor, and they were able to find me a car in under 2 hours. I went to look at it and drove it to pre-purchase inspection yesterday and after it checked out okay, I signed the deal the same day. This morning I had the check cut by my bank for the purchase and picked it up. It drives, looks, sounds, and even smells great. Has good sticky autocross tires on it too. I am now determined to make the event at Carowinds as long as I feel okay--had a cold since Monday and it's just letting off. 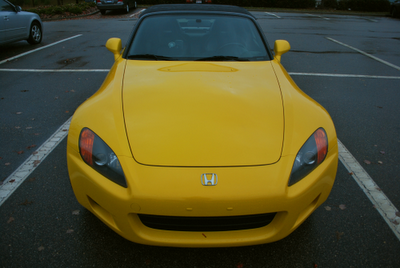 @misa: It is so much more than a Miata! I never thought I would be caught saying these words, but man, this new car rocks.